Elevate roasted brussels sprouts from delicious to divine by tossing them in this 4-ingredient pistachio sage relish. Company-worthy, but easy enough for weeknights, these crispy brussels sprouts are also gluten-free, dairy-free, paleo and vegan! I am not joking when I say that I could happily eat these crispy brussels sprouts as a main dish. Yes, they are that good. 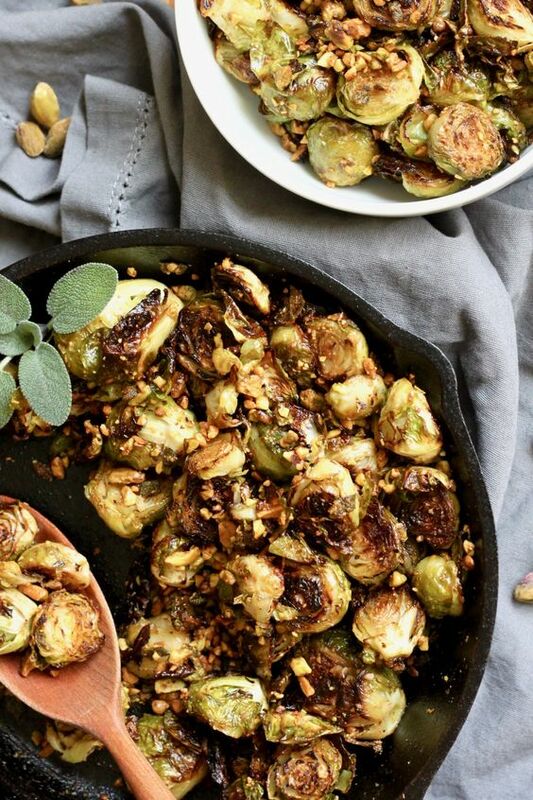 Toasted sage and finely chopped pistachios are the perfect pair to the crispy caramelized brussels sprouts. You will never miss the butter, bacon or cheese accompanying most crispy brussels sprouts recipes! 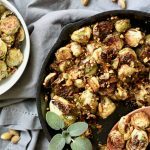 This roasted Brussels Sprouts with Pistachio Sage Relish recipe is a savory and delicious vegetable side you will crave! Company-worthy, but easy enough for weeknights, these crispy brussels sprouts are also gluten-free, dairy-free, paleo and vegan! A few stores sell ready to cook brussels sprouts, which can be a time saver. However, more often then not, I find that the freshest looking brussels sprouts are not pre-cleaned. To make weeknight meals a little easier and faster, like to prepare as many of the vegetables that we eat ahead of time. That includes brussels sprouts. I generally store the brussels sprouts in the fridge after removing the outer leaves. I have found that I can store produce longer if it is not washed. It takes less than 5 minutes to make the pistachio sage relish that elevates these roasted brussels sprouts to crave-worthy. Yes, a vegetable side can be crave-able. First, toss your cleaned and halved brussels sprouts in avocado oil. While your brussels sprouts are roasting, prepare the pistachio sage relish. First, finely dice the fresh sage. Next, finely chop shelled pistachios either by hand or in the food processor. Finally, warm the remaining avocado oil in a medium size frying pan or cast iron skillet over medium heat. 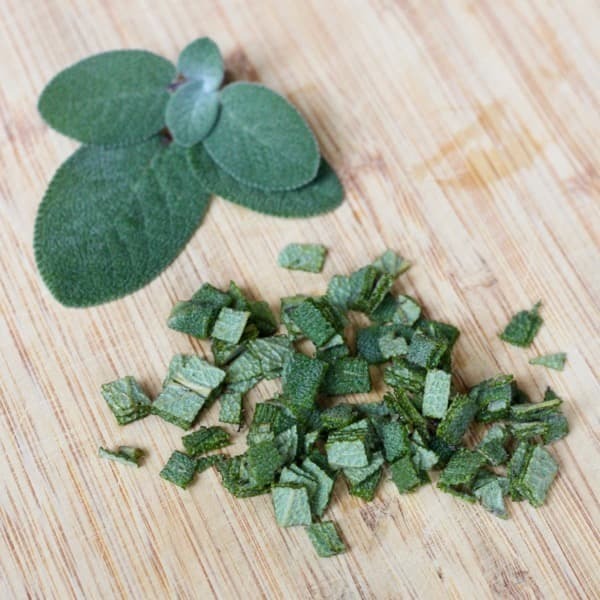 Add the fresh sage and sauté for one minute. Add the chopped pistachios and sauté them until toasted, about one to two minutes depending on if they were raw or previously roasted. Add the roasted brussels sprouts to the pistachio sage relish, toss, season with finely ground sea salt to taste and serve immediately. 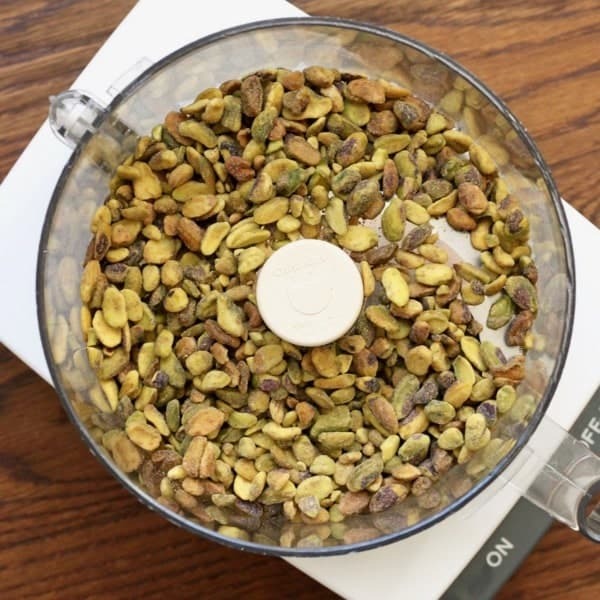 Note that the amount of sea salt you add with vary depending on taste as well as whether the pistachios were salted or unsalted. I can’t wait to try this. 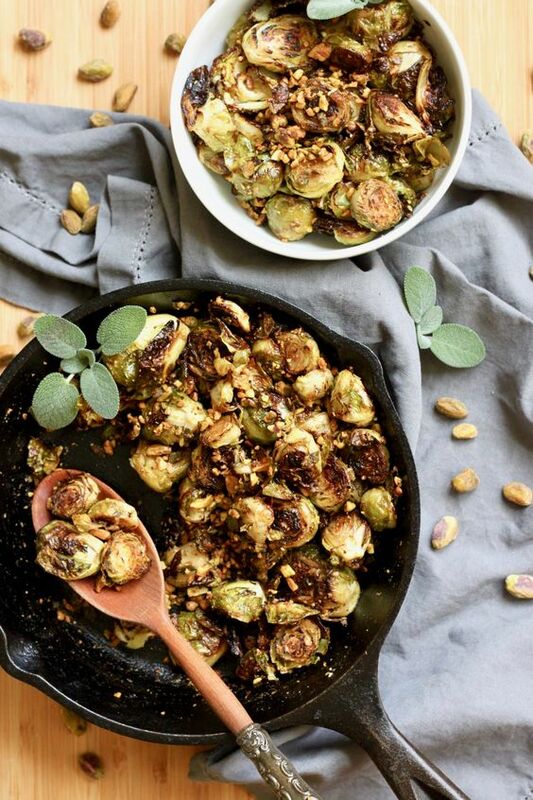 Such a great combination of pistachios and sage with brussels sprouts! I hope you love these crispy brussel sprouts Catherine! What an interesting flavour combination! 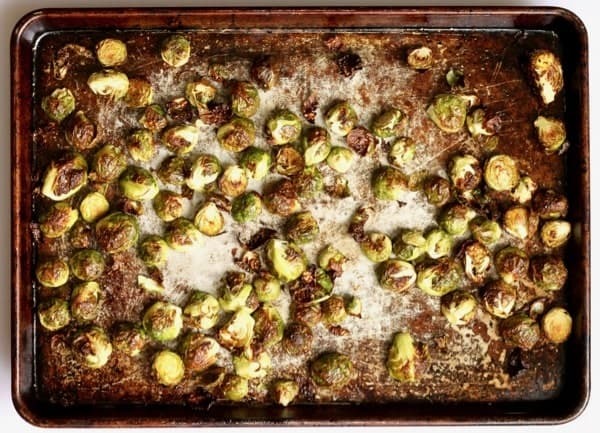 We love Brussels sprouts at our house and always looking to try new recipes. 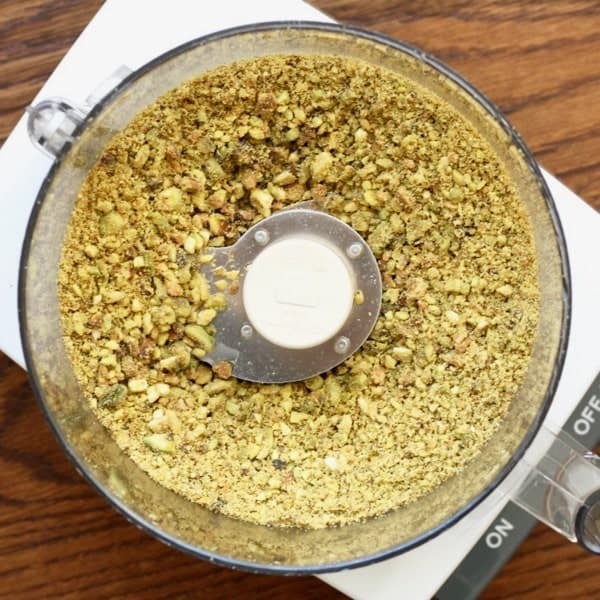 This looks like a delicious way to enjoy brussels sprouts – love the addition of pistachios! Have to go on my festive menu! OMG, adding the pistachios, so yummy! I love Brussels sprouts and they are my hubby’s favorite — so this is definitely a must-make! What a gorgeous and delicious side dish! Saving it for later ! Oh what FUN! My girls will really love this – they are obsessed with pistachios and they like brussel sprouts too! Thanks for the different side dish to try! Thanks Renee! This pistachio sage relish is definitely an easy way to quickly elevate yummy brussel sprouts to AMAZING! I hope you and your girls enjoy them as much as we do! 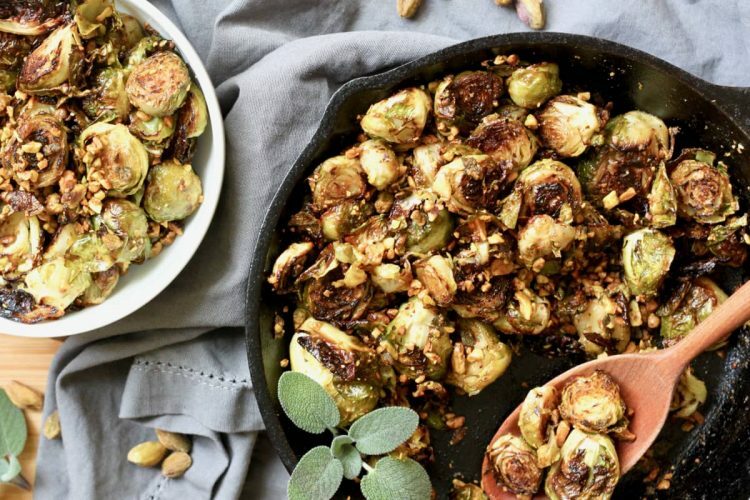 Love the crunchy addition, and sage with brussels is a great idea! Thanks Tessa! 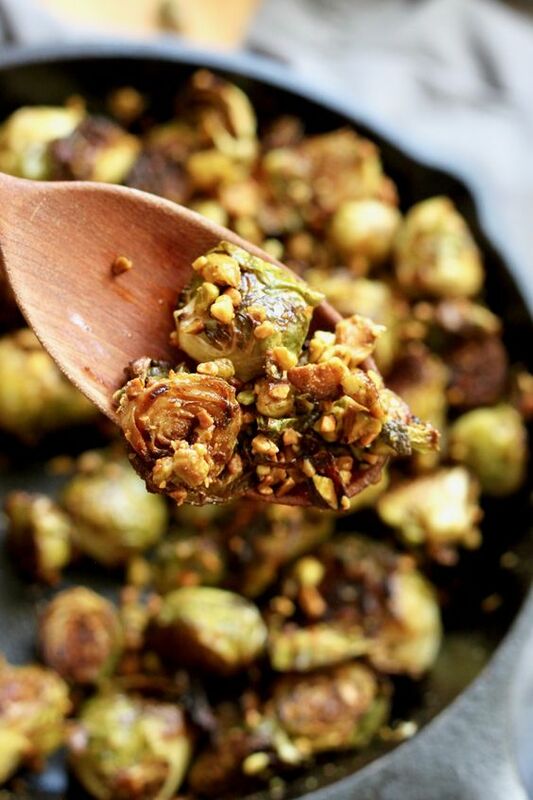 The crunchy pistachios are a delicious addition to these crispy roasted brussel sprouts! Simply gorgeous! Can’t wait to try that relish! Thank you Linda – I hope you love it! This looks amazing! There’s nothing better than crispy brussels sprouts and I love that you topped them with pistachios. Thanks Jean! 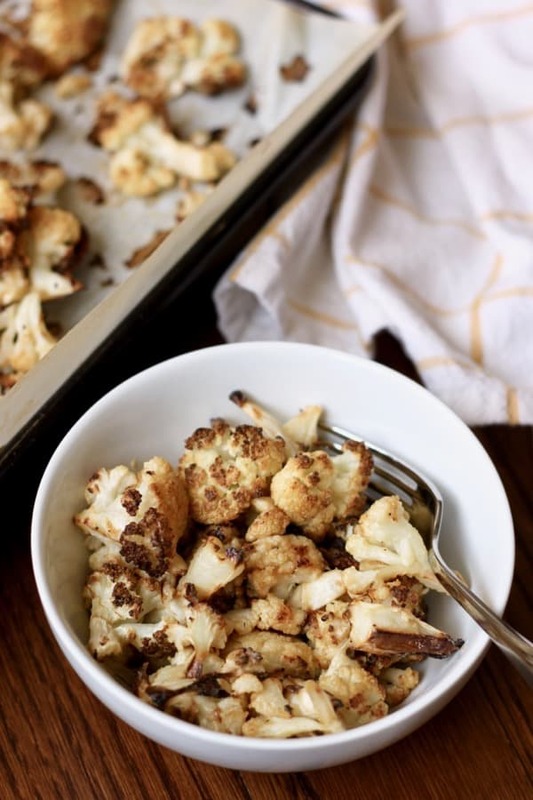 This side dish is packed with yummy flavors… I will admit to eating it for lunch too! 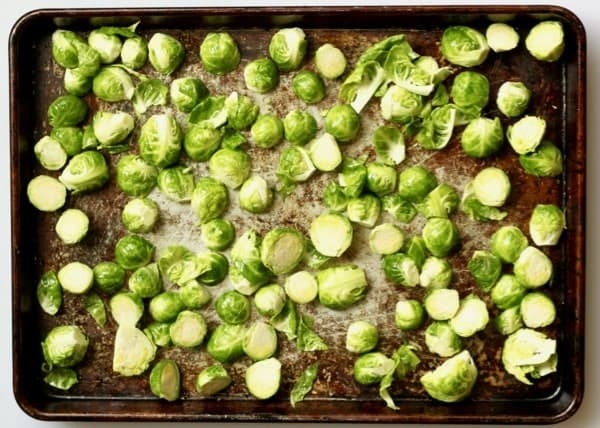 That is seriously a gorgeous pan of brussels sprouts! Thanks Raia – I hope you enjoy them! This pistachio sage looks so yum! 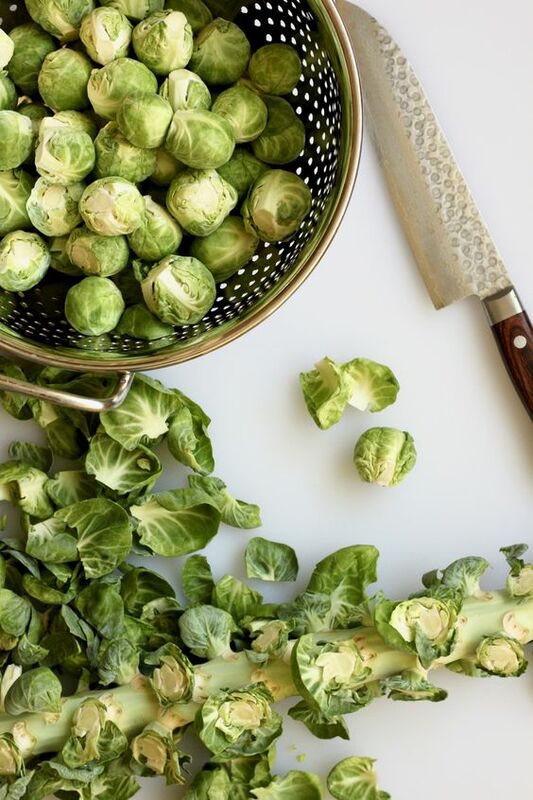 I love Brussels sprouts during this time of the year and cannot wait to try your recipe! I hope you like these brussels sprouts Joni! 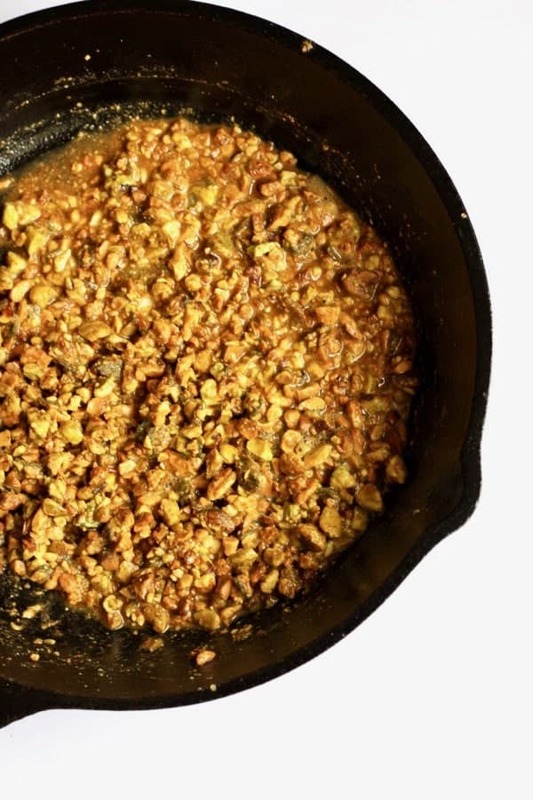 The pistachio sage relish really is an amazing addition… it adds so much flavor! Enjoy!!! Which is Healthier Wild or Farmed Salmon? Which is a healthier breakfast: eggs or oatmeal?